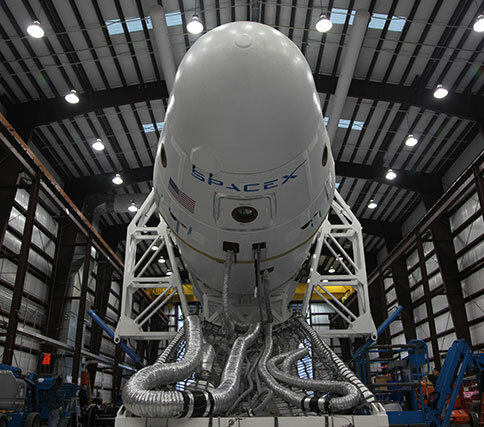 Will SpaceX Rekindle Interest In Mankind’s Final Frontier? Star Trekkin’ across the universe … that’s where space-watchers in the 1950s, 1960s and 1970s hoped we’d be by 2012. For once, science (or at least its application) has lagged behind expectations – the only way of planethopping today remains in your imagination, or by watching sci-fi reruns on TV. Those wildly optimistic hopes and dreams had their context in the 20th century inventions of satellite technology, giant rockets that could send monkeys, dogs and people into orbit around the earth and on missions to the moon. Not to mention the spectacular growth of commercial aviation after World War II and the supersonic Concorde, which had a cruising speed of Mach 2.04 (2170 kilometres per hour). Yet we have regressed in terms of space flight and civil aviation standards in the last few decades. The last manned mission to the moon, Apollo 17, was in late 1972. The final supersonic flight for Concorde landed in 2003. NASA’s final space shuttle mission was in 2011, after which NASA has been faced with the humiliating prospect of paying the Russian space agency slightly over US$60 million for each Soyuz spacecraft seat they use going roundtrip to the International Space Station (ISS) until the SpaceX Dragon or another American commercial spacecraft is ready for duty. In the interim Russian-built Progress cargoships will be used to supply the ISS with essential materials. We are at a key juncture for the future of human aviation and space flight. Back on Earth the combination of costcutting airlines and periodic government obsession with security is making flying increasingly frustrating and uncomfortable, all pat-downs, scans and shrinking legroom. As for space flight, the decisions made by governments and private corporations in the second decade of the 21st century will decide whether manned spaceflight will be relegated to a display at the Smithsonian’s National Air and Space Museum or evolve into serious plans to build a successor to the ISS and send astronauts to Mars. Construction of the International Space Station, successor to Salut, Skylab and Mir, has barely been completed in time for the end of the Space Shuttle program, and the ISS won’t last forever either. The NASA budget signed into law by President Obama in late 2010 extends the mission of the ISS until 2020. There is speculation that this could be extended until 2028, but nothing is certain. In the midst of all this gloom and doom, enter Elon Musk, Richard Branson and Google, putting millions of dollars on the line in a bid to reignite sparks of innovation and enthusiasm in manned space flight and scientific rover missions. If they succeed, within a few years US astronauts will be going on missions to the ISS in a SpaceX Dragon. The world’s rich will be able to take sub-orbital joyflights in Branson’s less-imaginatively named SpaceShipTwo. And the eyes of the world will able to view footage transmitted from the moon by a privately-funded lunar rover. NASA’s next heavylift vehicles to carry cargo and astronauts tothe ISS, SpaceX is in the lead position. Under President Obama’s bold and controversial new space policy, NASA abandoned the troubled Constellation program which aimed to develop the next generation of spacecraft and booster vehicles to replace the ageing space Space Shuttle fleet. Instead it offered seed funding and the possibility of lucrative service contracts to entrepreneurial commercial spaceship manufacturers able to provide workhorse vessels for transport to and from the ISS. In this way NASA could focus on flying to Mars and so-called “near-Earth” objects. So far this gamble has seemed to pay off. SpaceX successfully launched its Falcon 9 rocket and Dragon capsule from Cape Canaveral Air Force Station on December 8th 2010, followed by manoeuvres in orbit for the Dragon and a successful splashdown back on Earth. Russians are charging US astronauts per ISS seat in their Soyuz transports. But there is still a way to go. Transporting humans to space involves a great deal of safety testing. 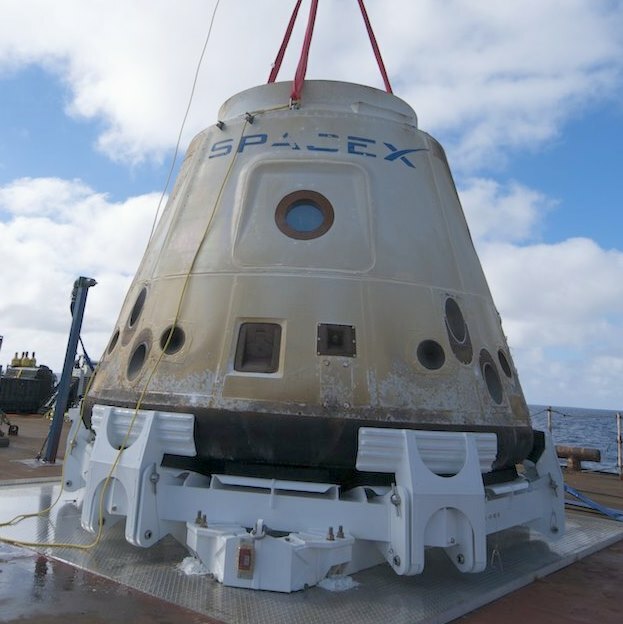 This week’s launch is SpaceX’s second demonstration flight under a 2006 Commercial Orbital Transportation Services (COTS) agreement with NASA to develop the capability to carry cargo to and from the International Space Station. To date, SpaceX has received $381 million for completing 37 out of 40 milestones worth a possible $396 million set in that agreement. Completed milestones include the first test flight in December 2010, during which SpaceX became the first commercial company to send a spacecraft to low-Earth orbit and recover it successfully, something that only three governments – the United States, Russia and China – have ever done. Virgin Galactic has its roots in Scaled Composite’s SpaceShipOne concept team, headed by Burt Rutan, which won the US$10 million Ansari X Prize for the first non-government organisation to launch a reusable manned spacecraft into space twice within two weeks. Richard Branson partnered with Scaled Composites to build two Five SpaceShipTwos (SS2), the first pair of which are called Enterprise and Voyager in homage to Star Trek, and two WhiteKnightTwos. On May 4th 2011, SS2 VSS Enterprise demonstrated its unique reentry ‘feather’ configuration for the first time, rotating the tail section of the vehicle upwards to a 65-degree angle to the fuselage. For several years Branson’s Virgin Galactic company has been taking deposits from aspiring and rich joyriders keen to stump up the full ticket price of (approximately) US$200,000. For that princely sum a ticket holder will get to experience a flight to about 110km above Earth, including a six-minute period of weightlessness at the apogee (the highest point of the flight’s orbit). The 110km altitude was not chosen arbitrarily, but because the internationally-recognised boundary between the Earth’s atmosphere and space lies at an altitude of 100 kilometres(62.1 miles), known as the Kármán line. Space starts here! In reality, of course, the atmosphere simply gets progressively thinner the higher you go above Earth; the 100km line was chosen because above that altitude a spacecraft has to fly faster than orbital velocity in order to derive sufficient aerodynamic lift from the atmosphere. The Google Lunar X Prize is a follow-up to the Ansari X prize. Launched in 2007, it offers the largest international incentive prize of all time – US$30m – in a prize-money pool to encourage competition among private investors in space science and exploration, with the new challenge being to build a lunar rover that successfully launches, lands and operates on the surface of the moon. The lion’s share of prize money – US$20m – will go to the team whose rover can travel more than 500 metres on the lunar surface and transmit high-definition images and video back to Earth. There’s US$5m available for second place, and a further US$4m in various bonuses, such as getting your rover travelling more than 5km, or making a precision landing near an Apollo site. A US$1m diversity award will be awarded for diverse use of science, technology, engineering, and mathematics. NASA Voyager I and II Spacecraft: Our Boldest Explorers Ever? If these attempts fail, then mankind’s greatest space achievement may be recorded in the history books as the Voyager I mission – launched on September 5th 1977 and still going strong, soon to enter interstellar space and travelling where no man (or no one) has gone before, and perhaps ever will – more than 17.4 billion kilometres from our sun. In 1977, two unmanned spacecraft, designed and built by NASA’s Jet Propulsion Laboratory, were launched on reconnaissance missions to the outer planets. Separate Titan/Centaur rockets launched Voyagers 1 and 2 in September and August 1977 toward Jupiter. In September 1977, Voyager 1’s camera looked back toward the home planet for a first-ever glimpse of the Earth and its Moon in a single photo. To find out more read NASA Voyager I and II Spacecraft: Our Boldest Explorers Ever? The risk that some European countries especially Portugal, Italy, Ireland, Greece and Spain may default on their debt and President Obama’s attention on earthly matters like high unemployment, broken US economy and the upcoming US Presidential election make manned missions to Mars seem unlikely this decade or the next. However if you’ve always dreamed of catching a rocket to the red planet Mars, marveling at the rings of Saturn and exploring the Kuiper belt past Pluto, watching the recent ABC TV documentary series Voyage to The Planets on DVD is the next best thing. I especially enjoyed the narration by well-known Australian actor Richard Roxburgh (Blue Murder, Rake, Sanctum) and the series is a great way to introduce space travel to younger members of your family. This article was originally published in GEARE Magazine issue #66. It is “digitally reprinted” here with permission from the editor. I have added updates where new information is relevant. Next PostNext What Are Hacker / Maker Spaces & Where Are They In Australia?